Gov Shame Spotlight | Motorists' Rights... Matter! | Motorists' Rights... Matter! 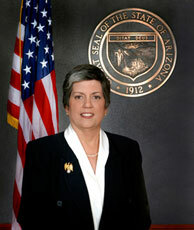 Prior to her election as Governor, Napolitano served as U.S. Attorney for Arizona and as Arizona’s first female Attorney General. The question is how could someone who has these credentials champion a program that requires complete disregard of due process of law and diverts our focus and resources from roadway safety, to revenue? Former Governor Napolitano believes public theft on a grand scale is an entitlement of the state; photo enforcement for revenue at the expense of safety as a state policy. Because of the success of scameras (enforcement traps), what she set in motion is just unimaginable. When you extrapolate the plan, the Governor aspired to issue a billion dollars a year in fines to motorists that are otherwise driving safely, according the FHWA and AZ DOT's own research data . Here is the finding on the study done before Governor Napolitano's billion dollar speed scameras program in Arizona. Its stated object was to reduce the carnage caused by speeding on the interstates, but there was a problem at the wonderfully successful test site - according the AZDOT itself there was no safety problem from speed there. Below is the AZDOT prior finding! Item 6) There did not appear to be any relationship between the reported accidents and the posted limits. This is true for virtually every other area in which she intended on using them. Simply stated, at the other areas she planned on assessing this billion dollars in revenue there is no underlying foundation or cause and effect safely benefit, whatsoever. In the only statewide study done by Arizona DOT in support of scameras (BHSPI Rebuttal to Final Report 551), they didn't actually study a single location. Hiding in the shadows etc targeting motorists going with the flow, otherwise safely, in the first 5 months the AZ DPS was able to write north of 700,000 citations with ZERO effect on safety. We need to change their slogan To Protect Hide and Self Serve. In 1995 Arizona's freeway speed limits in Arizona were set by DECREE of Governor Fife Symington, without any factual foundation whatsoever! In addition, this decree maintained the shall not exceed clause whose authority had just been repealed by Congress, in doing so he also negated Arizona's historic basic speed rule enforcement standards on these roadways. Arizona is not fiefdom, the people Arizona and those that visit there are not serfs to be done with as they will, and more importantly, it's speed laws are clearly unconstitutional by any measure. The other casualty in this process was the formerly respected Arizona Department of Public Safety(DPS). The DPS, AKA Arizona Highway Patrol, turned away from safety into being a predator which accepts bribes to get laws passed that enhance its and others abilities to feed on We the People(Sheeple). Devolving into an agency whose daily routine is dedicated to public theft while they wait for an assistance call, and when they do they're ill equipped to assist. In regards to red light cameras here is the presentation (powerpoint) we made to the Institute of Transportation Engineers that quantifies best signal timing practice as well as how and where our laws were changed/highjacked to facilitate red light cameras. The litany of illegal practices in Arizona's current scamera programs would fill a book, but suffice to say none of it is based on safety. Below is just one of the many ways they entrap their motorists and visitors with scameras in violation of the law. The stop line is where you enter the intersection and to where the signal timing is supposed to be set. But in Arizona for enforcement purposes they moved the enforcement lines. The Judges also profit from this illegal practice. So the Governor, the courts and the cities all have a financial interest in unsafe practices that also violate due process; this sure doesn't bode well for We the People or our safety. Systems Operators in Arizona: Lies, Quotas, Short Yellows, Reducing Intersection Size to Entrap Motorists... AND if the cameras are for safety, why does it violate the contract if you fix the intersection is such a way that it reduces the number of entries on red? Here is how The FHWA states it on its red light website, what Arizona is doing is non compliant with controlling federal laws. A driver is running a red light if his or her vehicle enters the red shaded area, after the light turns red. According to the MUTCD, the boundary for a red light violation begins at the marked stop line. If there is no stop line, then the boundary begins at the crosswalk on the near side of the intersection. If there is no crosswalk or stop line, the intersection begins at the extension of the curb line or roadway edge. Some states are using the extension of the curb line to mark the boundary for red-light running regardless of whether there are stop lines or crosswalk. This practice is not consistent with the meaning of the red signal in the MUTCD. Greed and abuse of power knows no end, in the photo above notice the protected right turns which are a safe movement under any circumstance, particularly when done in protected right turn lanes like these. Citations for these safe movements have become the greatest source of revenue now, shameless and unconscionable public theft.